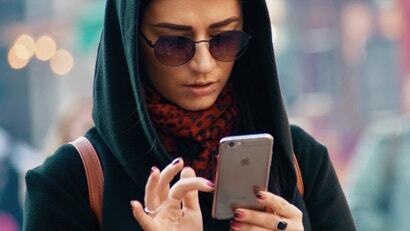 For most, buying a new smartphone is easy — you just get the latest version of whatever it is you've been using. If you're dissatisfied enough, or you don't want the latest Galaxy, Pixel, or iPhone (to name a few), then it's time to go shopping, and you'll have a sea of smartphones to wade through in order to find the perfect one for you. Given just how much there is to look at — thanks, Android — searching for a new smartphone can feel daunting. Thankfully, the fine folk over at GSMArena have a handy tool you can use to narrow the field. 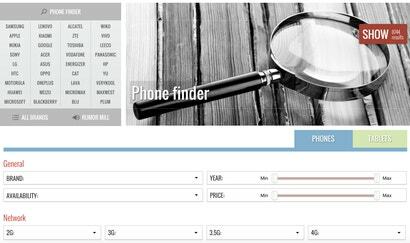 The site's "Phone Finder" is an incredibly useful way to search for your next smartphone based on the specs that are the most important to you. And you can pick from a lot: price, size, thickness, display resolution, camera resolution, etc. The Phone Finder won't be the most useful if you're looking for the best smartphone ever created — it doesn't offer rankings, after all, just a list of phones that match the specs that matter most to you. However, if you don't want to spend top dollar for the most feature-packed smartphone you can get, the Phone Finder is great way to start making those agonising price/feature trade-offs. Or, at the very least, it can help you confirm if you can actually get a 6.3" smartphone for a reasonable price. Once you've picked your specifications and clicked on the big red "Show" button, you'll see the list of smartphones that meet your criteria. You can click on any of them to see the device's comprehensive specs, but I find it more useful to use the site's "Compare" tool — right beneath "Phone Finder Results." 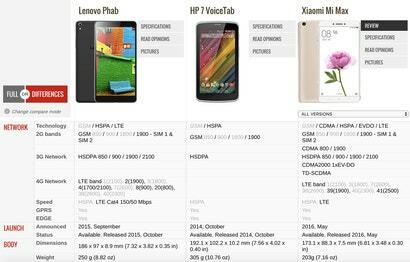 Click that, then click on up to three of the smartphones you'd like more information about (aim for the boxes, not the images of the smartphones themselves). Click "Compare" again once you've made your picks, and you'll get a giant table that spells out what each smartphone can do. If the massive amount of data feels overwhelming, click on the "Differences" option to see what the smartphones have in common (grey text) and where they differ (black text), which might help make your purchasing decision.